Can you please help me understand from scratch about DDL & DML? DDL is Data Definition Language : it is used to define data structures. DML is Data Manipulation Language : it is used to manipulate data itself. DDL is short name of Data Definition Language, which deals with database schemas and descriptions, of how the data should reside in the database. DML is short name of Data Manipulation Language which deals with data manipulation, and includes most common SQL statements such SELECT, INSERT, UPDATE, DELETE etc, and it is used to store, modify, retrieve, delete and update data in database. 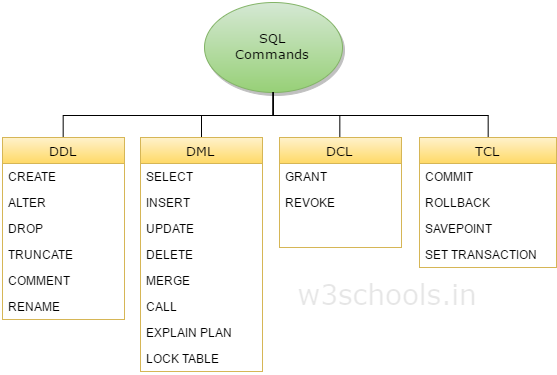 DCL is short name of Data Control Language which includes commands such as GRANT, and mostly concerned with rights, permissions and other controls of the database system. TCL is short name of Transaction Control Language which deals with transaction within a database. Create and modify the structure of database object in a database. CREATE, ALTER, DROP, TRUNCATE, COMMIT, etc. DML statement are affect on table. So that is the basic operations we perform in a table. Basic crud operation are perform in table. These crud operation are perform by the SELECT, INSERT, UPDATE, etc. INSERT, UPDATE, SELECT, DELETE, etc. 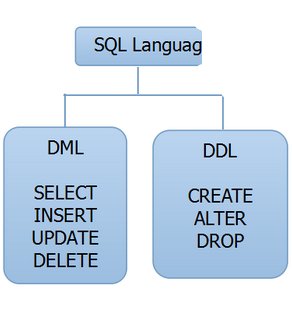 DDL is Data Definition Language : Specification notation for defining the database schema. It works on Schema level. DML is Data Manipulation Language .It is used for accessing and manipulating the data. In layman terms suppose you want to build a house, what do you do. You want to control the people what part of the house they are allowed to access and kind of access. DML is abbreviation of Data Manipulation Language. It is used to retrieve, store, modify, delete, insert and update data in database. DDL is abbreviation of Data Definition Language. It is used to create and modify the structure of database objects in database. DDL is Data Definition Language: Just think you are defining the DB. So we use CREATE,ALTER TRUNCATE commands. DML is after defining we are Manipulating the data. So we use SELECT,INSERT, UPDATE, DELETE command. Remember DDL commands are auto-committed. You don't need to use COMMIT statements. DML (Data Manipulation Language) commands need to be commited/rolled back. DDL(Data definition language): will work on structure of data. define the data structures. DDL stands for Data Definition Language. DDL is used for defining structure of the table such as create a table or adding a column to table and even drop and truncate table. DML stands for Data Manipulation Language. As the name suggest DML used for manipulating the data of table. There are some commands in DML such as insert and delete. Not the answer you're looking for? Browse other questions tagged sql ddl dml or ask your own question. Are Stored Procedures DDL or DML? Why does full outer join in HIVE gives weird result when one of the join fields is missing? psycopg2: How to know when cur.rowcount does not mean number of rows? When to use MODIFY and UPDATE database command in MySQL? Do I need to COMMIT when interleaving DDLs and DMLs? How to notify failure of ddl,dml scripts through jenkins? Why alter command is referred as DDL and not DML? What are the origins of terms DDL, DML and DCL?